Amid all the big-money superstars and ludicrously well-paid Premier League entities that are part footballer part international brand, sometimes it’s easy to overlook promising young players with unfashionable, British names that play for unfashionable clubs. 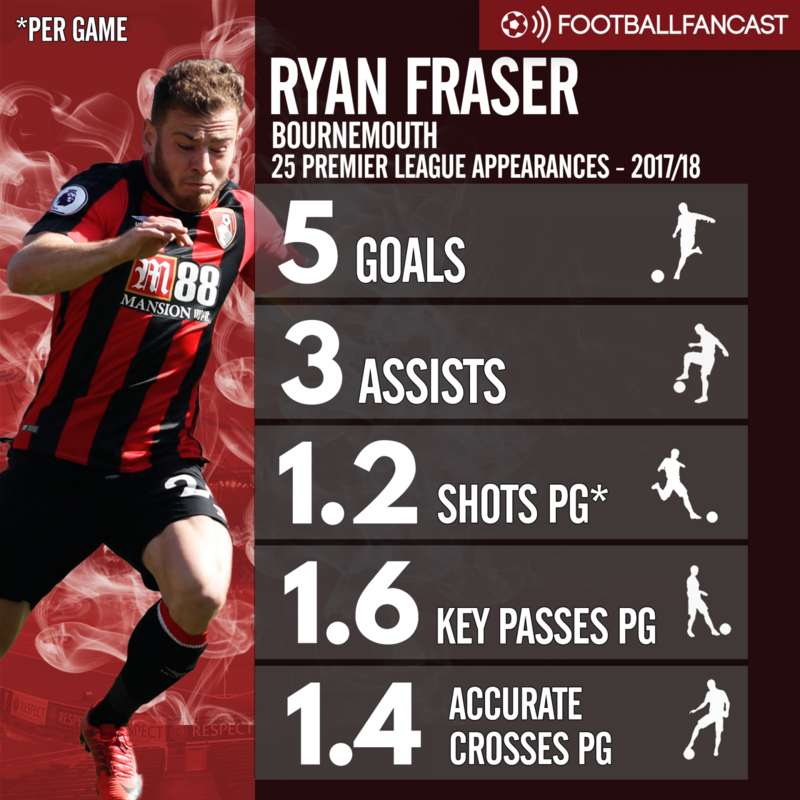 Although Bournemouth are more stylish than most outside the current top six, who have spent much of the season resorting to hoofball tactics to avoid relegation, their creative midfielder Ryan Fraser firmly falls into that category. Fraser’s time in the Premier League with the Cherries has been laced with little moments of quality, and Bournemouth’s 1-0 win over Swansea City on Saturday provided another example. While the Welsh side were no doubt caught napping at a set piece, Fraser’s curled finish gave Lukasz Fabianski no chance of saving his shot from the edge of the box – and that moment of perfect technique proved to be the difference in a game of minimal margins at the Vitality Stadium. But there’s an edge to the 24-year-old’s game as well, that typical aggression players of modest stature – measuring in at just 5 foot 4 – sometimes need to survive on the same pitch as the many beastly physical specimens in the Premier League. While he’s not a hugely prolific tackler or powerful presence, there’s an energetic edge to Fraser. He was once described as an ‘anxious’ player and that really stands out in his movement – whether with the ball or without it, he always carries a sense of urgency, a desire to do things quickly and diligently. Fraser’s shown these abilities before, but this season particularly feels like something of a breakthrough. For starters, he’s already set a career-best haul of five goals and could add to it during Bournemouth’s final outing of the campaign at Burnley. But perhaps more significantly, 2017/18 has shown what he offers Eddie Howe’s side in terms of versatility. Previously, the two-cap Scot’s been at his best for Bournemouth when taking up advanced roles, particularly when he’s found ways to drift into central areas and really drive at the opposition with the ball at feet. But this season, his most influential performances have come at wing-back, a position that requires relentless fitness and a dose of defensive maturity – knowing when to support the backline rather than join the attack, and knowing that one positional error could leave his entire flank glaringly exposed. That only adds to Fraser’s appeal, especially amid a period in which three-man defences have become an increasingly popular setup in the Premier League. The diminutive midfielder has played as a wing-back on both sides this season and plenty of managers in the division would like that versatile option, including David Moyes at West Ham; while Arthur Masuaku and Pablo Zabaleta have been amongst the Irons’ best performers this season, their results have desperately declined when one has been absent. Fraser lacks Masuaku’s tricky explosiveness and Zabaleta’s impressive nous but would be a solid backup option to both – someone who offers real tenacity and quality of delivery from out wide.